Can We Predict Decline Before Fastball Speed Drops? Danny Salazar’s effectiveness has declined in concert with his decline in velocity (via Erik Drost). On average, pitchers begin losing velocity the minute they reach the majors. Age and injuries begin to degrade pitchers and some begin to become shells of their former selves. But some don’t. These pitchers are still productive as their fastball loses more and more zip. But not every fastball is the same. While we generally think of a pitcher’s velocity in terms of his average velocity, in each game a pitcher’s velocity on his fastball will vary by roughly 5-6 mph, and in some cases even more than that. So I wanted to investigate whether we a pitcher’s individual pitch values at different fastball speeds would help determine how a pitcher will age. He was still productive when his velocity dropped in 2009. 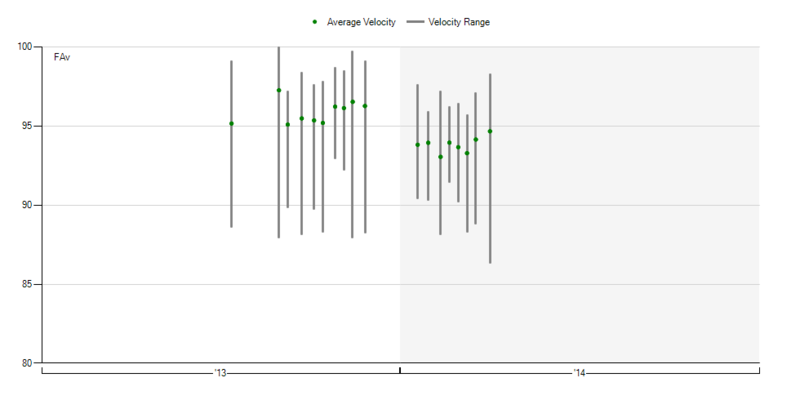 From 2011 to 2012, when his velocity dropped another two mph, he did see a huge drop in production. Since 2010, Hernandez has lost two mph off his fastball, but is basically producing at the same level. Carson Cistulli took a stab at trying to answer this question by using game outcomes and velocities to look at how Ubaldo Jimenez struggled with decreased velocity. This method may have its virtues (subject to later possible study) in determining how a pitcher will perform at a decreased velocity. One issue that may arise, however, is that a pitcher might not transition slowly into his new velocity level. His velocity may take a major dive like Lincecum’s did from 2011 to 2012. 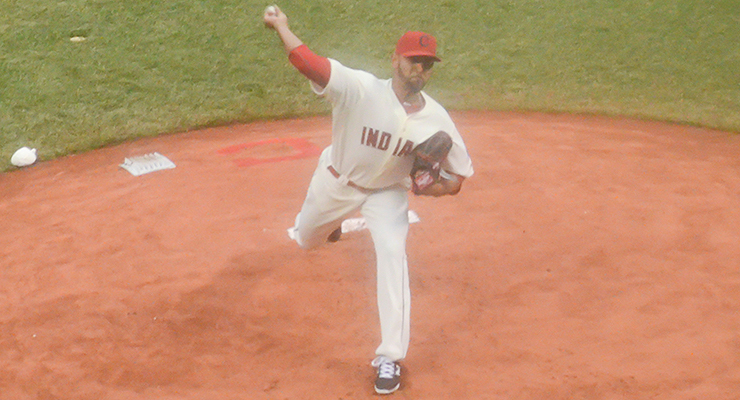 Another pitcher who had a major velocity drop this season is Danny Salazar. Last season he burst into the majors with a 96 mph fastball, and he struck out more than 30 percent of the batters he faced. This season his average fastball speed is down 2.5 mph, and both his strikeout rate (down five percentage points) and walk rate (up two percentage points) have gone in the wrong direction. His rate of home runs per nine innings has gone from 1.2 to 1.8. The combination has led to an ERA of 5.53, way up from his 3.12 of last season. The drop in performance was not lost on the Indians, who demoted him back to Triple-A Columbus on Friday after he couldn’t escape the fourth inning on Thursday. Those are averages, but just over 30 percent of his 2013 fastballs were slower than 95 mph. I wanted to know if I could use the per pitch run value on these fastballs at the lower end of the velocity spectrum to predict his belly flop of a performance in 2014. Were hitters able to make solid contact more easily with them? Could they be a sign of problems to come? Obviously, it’s not that simple — there could be some sampling issues with the data. First, the fastball may be thrown slower, compared to other fastballs, to keep the hitter off balance. Also, a loss of speed may mean more break, which can just as beneficial as a change of pace. Furthermore, the pitcher may be looking to get a weak batted ball instead of a swing-and-miss. Besides the intent of the slower fastball, other known factors may be acting on the slower pitch. Some pitchers see their velocity decline over the course of a game (though a few, such as Justin Verlander, do increase) and the effects of the second and third time through a batting order may be over-weighting the decline. In the end, I kept the data simple and just used the run values. The key hope behind using per pitch run values was to use a larger sample of data (every fastball) and having the ability to look at every pitch instead of games. No real surprise with the data: a faster fastball is more productive. To get an idea of how run values correlate with ERA, FIP and xFIP, here are the correlation equations from run values to ERA and its two estimators. Using the values in the above image, here are the estimate ERA/FIP/xFIP knowing the run value. If you look hard enough, you see that as his velocity declines, his run values increase (which, again is bad). Could it have been possible to have an idea of his decline? To find out, we want to see how the data correlates between seasons. The answer is, essentially, not very well, and this points to the theory being effectively moot. At the high end of the spectrum, where a pitcher has 500 fastballs in a one mph band, the data correlate with a r-squared of .10. That’s a small enough number that we can say that it basically doesn’t correlate at all. And this R-squared value is when the pitcher has the most number of pitches in a band. I was hoping the data at the low end of the spectrum could tell me something going forward, but no such luck. Again, using Salazar as an example, he had approximately 300 pitches total less than 95 mph, and not all all of them were grouped into the one mph bands I used here, which splits the sample up even more. So what does all the preceding work mean? Pitch values may not be the way to analyze individual pitches. The only decent other measure I can think of is swinging strike rate, though I am open to suggestions, and welcome you to share your thoughts on the matter in the comments section. Maybe I could expand the data to three mph blocks, but the range may not detect a talent level decline. If the range were 90 to 93 mph, Lincecum’s average values from 2011 and 2012 would both be selected. We may not be able to determine which pitchers will be able to thrive at lower velocities, but while I am crying “Uncle!” for the moment, I am not ready to concede the idea entirely. I expected to find some useful insight when I began using run values to look at the production loss as a pitcher sees his velocity decline, but did not. There simply does not seem to be enough data once you break up velocity into different mph bands to get a good idea of how a pitcher will decline. For now, we should just assume a league average decline until the pitcher’s other stats begin to stabilize at his new fastball velocity. * To put some numbers behind how small the change would be, in 2013 Danny Salazar threw only 35 pitches in his current range of 93 mph to 94 mph. He would need 12 times as many pitches to just get near the 400 pitch value and a r^2 of of .1. At a .1 r^2 value, 10 percent of the player’s talent is his own and the rest is the the major league average. So using Salazar’s 35 pitches in 2013 would predict less than 1 percent of this 2014 value. Cohort 2 will age better as fastball velocity declines, as they’ll still be able to hit their spots. I’m too dumb to even know what I don’t know – Is this possible to measure using pitchfx? The best aging pitcher with reduced velocity is one that can still locate a fastball and still generate movement. These guys exist too. It’s not one or the other, even if this is a special group. Face it, the human brain still processes way more data than a spreadsheet. That is why we need scouts and will need them for a long time. A spreadsheet does not process data. It organizes data so that a human brain can process it. A spreadsheet does indeed process data. It is a functional program with the ability to solve and execute complex equations and logical expressions. This is just spitballing a suggestion, but could you think about using standard deviations and z scores of fastball velocity? Would standard deviations even be meaningful in terms of actual velocity differences? If Salazar’s standard deviation on fastball velocity is only 0.6mph or something like that, it may not be particularly useful. I think this concept is useful if the idea that a pitcher’s difference from his own velocity baseline is more important for performance than an absolute reduction. Idea spitballed. Good idea. A little harder to set up, but good. Use pitcher grouping to increase the sample size, nice. Look at BABIP as a component of functional outcome. The Sport­wagon shed its hood ornament http://www.active-tools.com/topmenus.aspx and the Vista-Cruiser got a revised front bumper because the parking lights were moved up to a spot between each pair of headlights. Power on the optional Cruiser engine was nudged up to 320 horsepower.